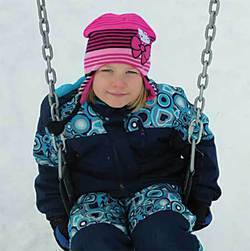 Jan. 9, 2014 11:00 a.m.
"The swings are probably the favourite and best used piece of equipment on the playground," stated Principal Maltais. It just goes to show that size does not matter. Pipestone, which is a very small rural community situated between Calmar and Pigeon Lake, took on and completed a large project this year in order to bring smiles to local children's faces. It all began during the summer of 2012 when the community discovered that at some point in time over summer vacation at least one, or maybe multiple, summertime Grinches with more time on their hands than brains in their heads, had driven some form of machinery onto the playground at the Pipestone Elementary School and destroyed the school's swing set. They twisted it up like a pretzel. They also tore up the ground something awful and generally made a mess of the space that usually brought a lot of joy to the small students at the Pipestone School. Being a little rural school this destruction was pretty devastating to both the kids and administration because they did not have the financial means to replace the wrecked playground equipment and landscaping. So the school Council put together a fundraising letter in the fall of 2012 and that is when miracles started to happen. "Everyone in the community came together, whether they had kids in the school or not," said Pipestone Principal Wendy Maltais. "People didn't bat an eye and made it happen for the kids." The Mulhurst Legion, Mulhurst Firehall, and the Pipestone Community League immediately stepped forward with both monetary donations and manpower along with many families and individuals. Unfortunately, the swing set was not the only casualty in this senseless act of vandalism because in order to repair the playground footing and install a new swing set the kid's beloved "tire mountain" had to be torn down. The tire mountain was a giant hill created by stacking huge tractor tires on the bottom, filled with sand for support, and then consecutively smaller and smaller tires as they were stacked to create a massive rubber hill the kids could climb all over. The tire mountain was donated and created 30 years ago by the Anderson family whose children were attending the school at that time. As life often goes full circle so did the "life" of the tire mountain as the Anderson family once again donated their time and effort by bringing in their machinery and removing the tires from the Pipestone School which their grandchildren now attend. In spite of all the good will from the community, all did not go entirely smoothly with the installation of the new swing set. Large holes had to be dug in order to place the footings for the new set but there were issues in locating the actual site of the underground utilities so a HydroVac truck had to be brought in for that purpose. This work was being completed just this summer and with all of the rain that we experienced the truck got stuck in the playground mud not once, but twice! Both times neighbour Richard Hirsekorn jumped into his tractor to chug over and pull the HydroVac truck free. With a lot of hard work and community spirit the new swing set was installed in time for the opening of the 2013 school year this September. And with a nod to the lost tire mountain there was even enough money donated to install an additional tire swing for the kids! "The swings are probably the favourite and best used piece of equipment on the playground," stated Principal Maltais. "As I look out my window right now the kids are still on them even in the snow!" she laughed. "I can't say enough good things about this community. People really came together for the kids. It just proves what a great community we live in."